Choosing a lender isn't the first step in becoming a homeowner. In reality, the home buying process begins with your finances. Without an above average FICO score, purchasing a house is harder and, you could find yourself renting longer than you expected in Kearny, New Jersey until you raise your score. When you apply for a mortgage or any other loan, lenders want to make sure that extending a loan to you isn't a problem. Your FICO score gives lenders an insight into what type of borrower you'll be based solely on your credit history. Because of the shift in the economy, most home buyers should have scores in the range of 740 or higher to get a satisfactory interest rate. You'll still qualify for a loan with a lower score, but the interest accumulated in the long run could be more than double the amount of someone with a higher FICO score. I'm used to working with all levels of FICO scores. Contact me and I can help you get on the right track to the home of your dreams. Even out your debt. At first, this doesn't sound like a good idea. But, you steer clear of having one card that is maxed out and have the rest of your cards at a zero balance. It's better to have each of your cards at a smaller balance than to have the most of your debt transferred to one card. Store cards and service station cards. For those who have non-existent credit or low credit, retail credit cards and gas credit cards are ways to start your credit history, increase your spending limits and have a solid payment history, which will raise your FICO score. You should always beware of carrying a large balance for more than a couple of months because these types of cards normally have a surprisingly high interest rate. Don't let your cards get dusty. Whether you have older cards, or are just getting started with credit, be sure to use your cards to make sure your accounts stay active. But, be sure to pay them off in no more than two or three payments. Keep up with payments. Your credit score plummets with every account that goes to collections. It's one of the reasons people who have recently been unemployed see the biggest dip in their credit score. Yes, it takes longer to restore your credit this way, but it's the most reliable way to show that you're responsible enough to make payments to a bank. Correct your credit report. If you discover mistakes on your credit report, contact the bureau requesting that the item be removed. If you have a common name or the same name as a family member, you'll want to give extra care to make sure the activity reported is correct. Knowing the methods you can use to improve your credit score, you're one step closer to becoming a homeowner. Keep in mind that when you're ready to apply for a loan to purchase a home, you'll want to keep your credit inquiries within a two-week window to avoid damaging your credit score. With the help of Rosa Agency, the loan process is sure to go more smoothly so you, too, can achieve home ownership. I work with all levels of FICO scores and can help you step into home ownership with the best lender for you. 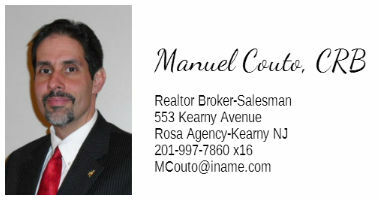 E-mail me at mcouto@mcoutorealtor.com or call (201) 997-7860 x116 for more information.